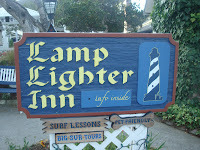 Our recent stay in Carmel California brought us to the delightful Lamplighter Inn. 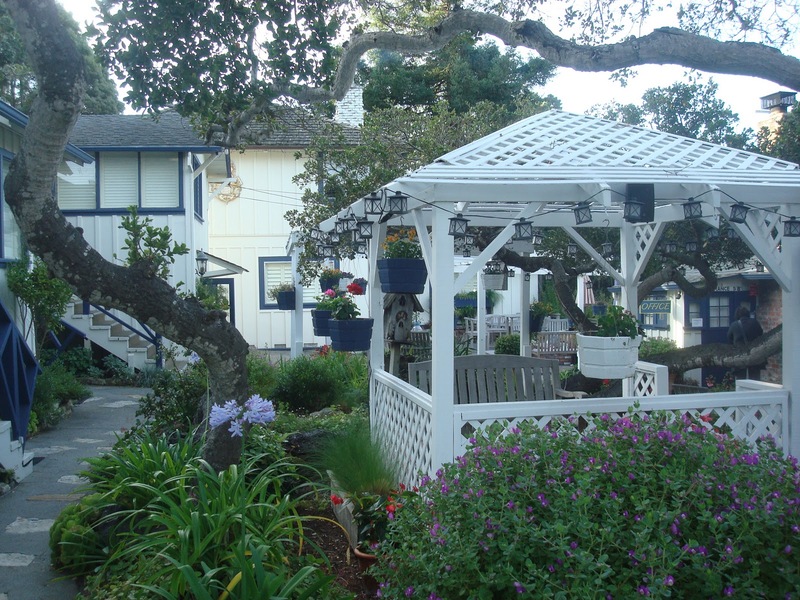 Located just minutes from one of the country’s most picturesque beaches, with amenities for your pet companion, these pleasing rooms and cottages are to be considered when looking for accommodations for your stay in Carmel California. These cottages are especially nice for those traveling with young children and dogs. There is an outdoor shower to wash off the sand after a busy day at the beach with your family and your pet. All the rooms have a unique charm and quaintness that will appeal to any traveler and many of the rooms have fireplaces to keep you cozy and warm from any fog shrouded evening. This lovely quaint hotel also features an attractive courtyard bordered by flowers and handmade bird feeders decorate each room and cottage, accenting the appeal of this landmark property that has been around since the 1930’s. 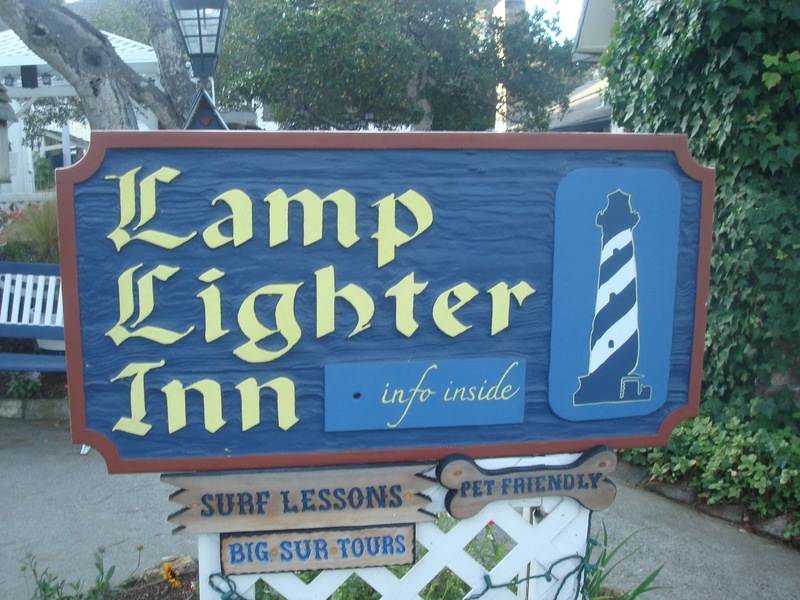 For guests that love the wine culture of Monterey County , the Lamplighter Inn features a Wine and cheese reception on Friday, Saturday, and Sunday between 5-6 PM. 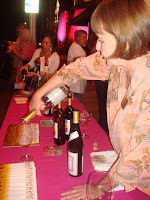 You can sample many of the great wines from the nearby vineyards while enjoying the company of fellow travelers. Many hotels today feature complimentary breakfast buffets but the Lamplighter Inn does it one better . All stays include a complimentary breakfast basket. served to the room between 8.30 – 10.00 AM. Now THAT is service. 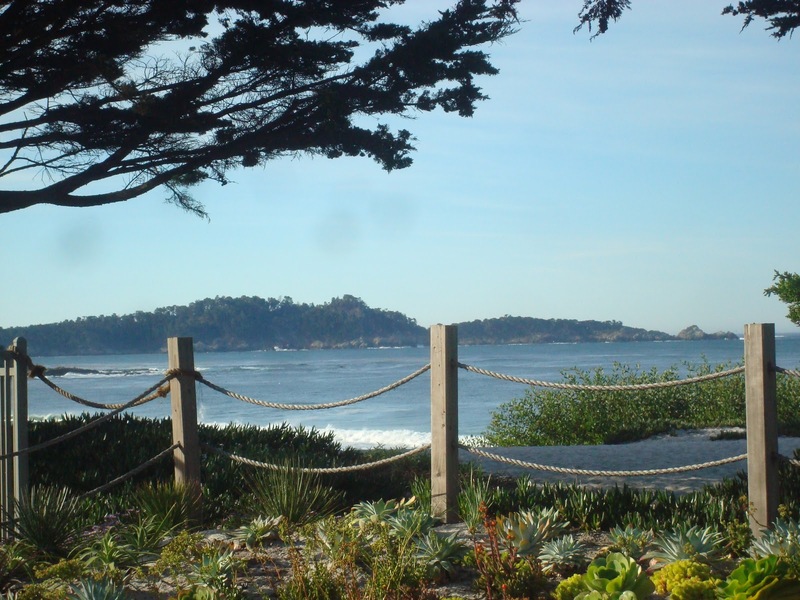 Carmel is known all over the world for its famous beach , Pebble Beach golf course , shopping and historic hotels with some world class dining. The lovely city was created to be a walking city and it still is today. The Lamplighter Inn is within walking distance of the best Carmel has to offer. 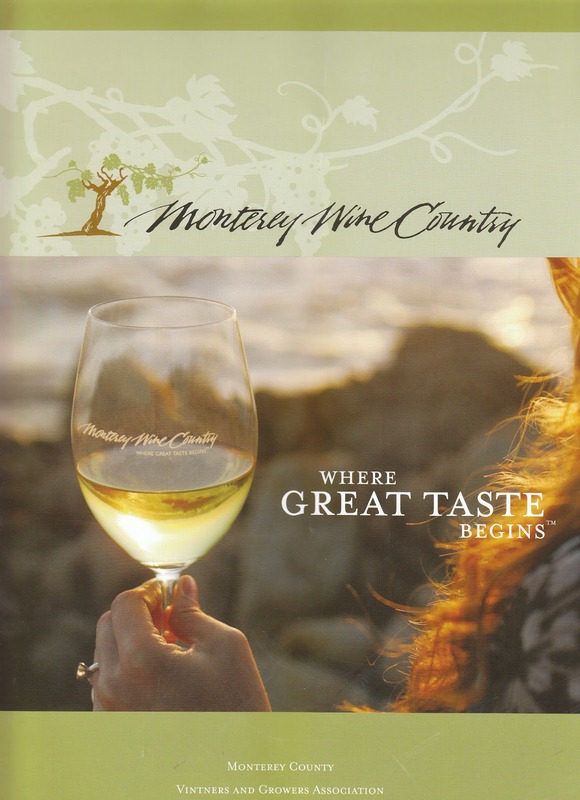 Monterey County California is almost half way between Santa Barbara and San Francisco and has some of the most fertile Vineyard and Agricultural land in the United Sates. 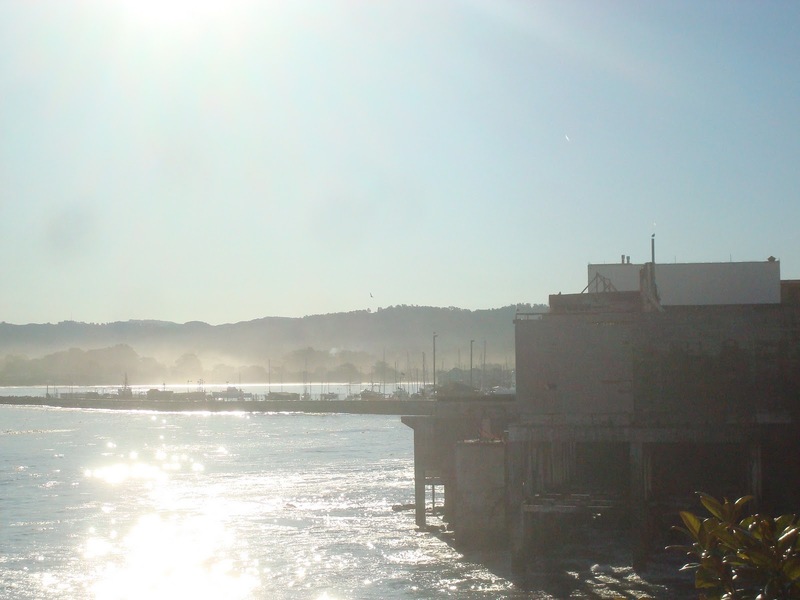 The history from Monterey’s Cannery Row to the fertile Salinas Valley was made known to the world when famed author and resident John Steinbeck wrote extensively about the people and the area is his well known novels “The Grapes of Wrath “ and “ Of Mine and Men” just to name a few. The “upside down , backward river “ is what Steinbeck himself called the north flowing Salinas River that carved out the Salinas Valley which today feeds 80% of our country’s ’vegetable needs. 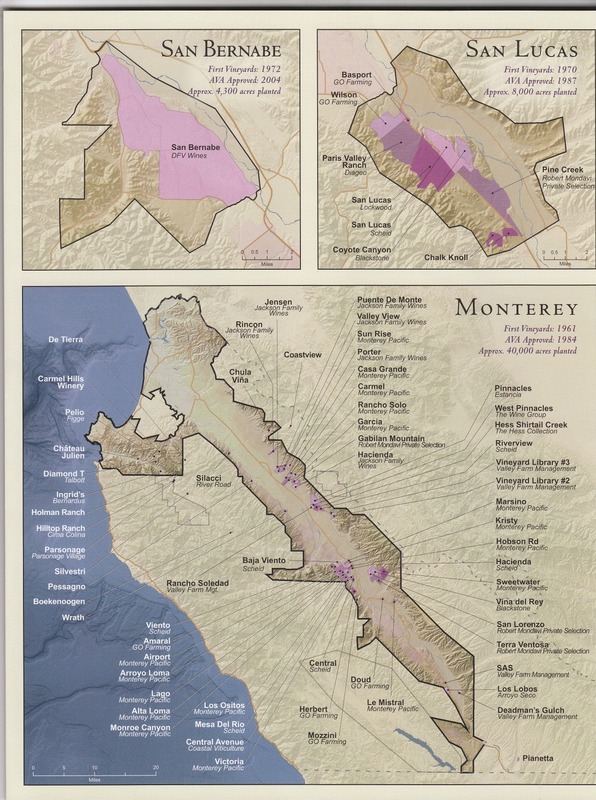 Approximately 85 vintners and growers call Monterey Wine Country "home" which has been overlooked for some time. 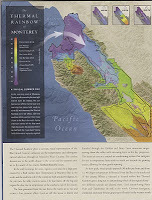 Monterey County’s lifestyle and wines are defined by the influence of the ocean and especially of Monterey Bay . 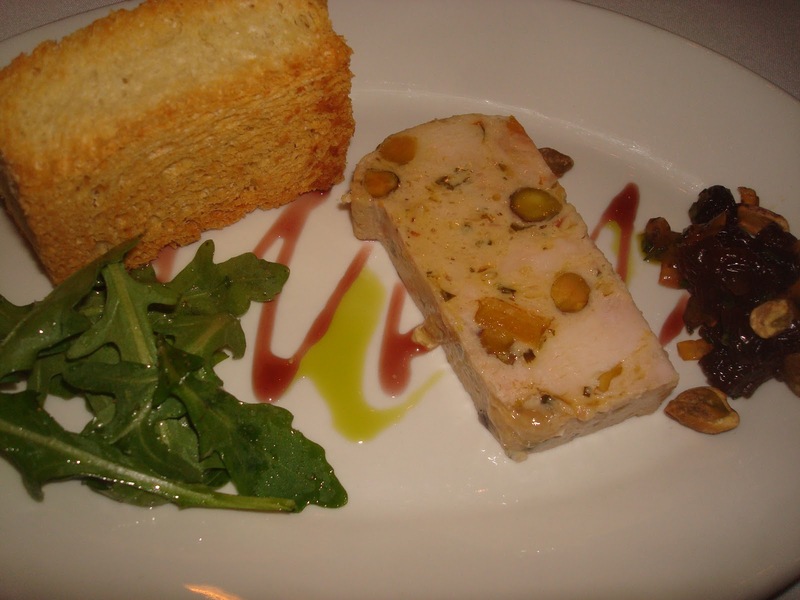 The region is a unique place to visit as many enjoy all of the aspects of food , wine , history and entertainment the area has to offer. Many of the Monterey County wineries now have tasting rooms open to the public and provide a relaxed atmosphere where guests receive personal attention while tasting wines and learning about the winery. 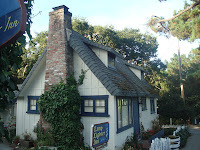 emier Food Monterey Wine Country Great Escape Weekend is held in November, which is probably the best weather of the year in Monterey. 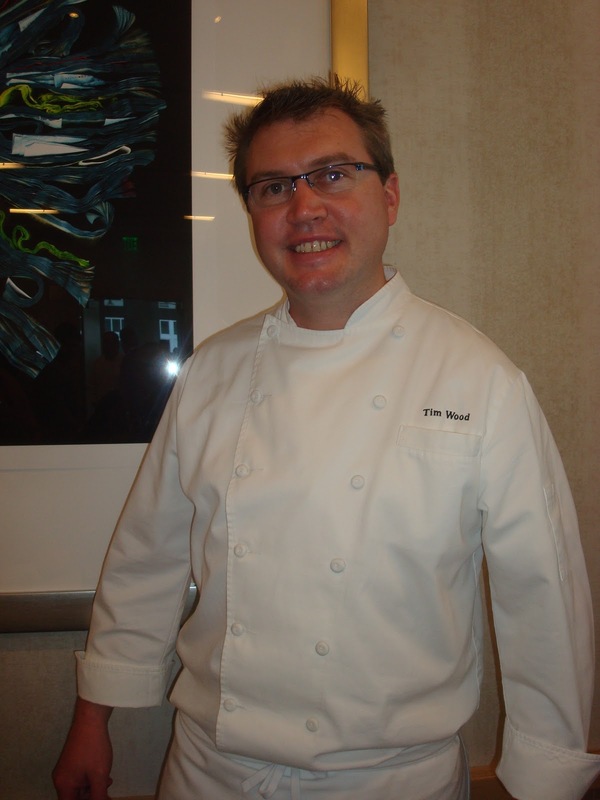 The Great Wine Escape celebrates Monterey Wine Country’s world class wines and gastronomic delights crafted by nationally recognized chefs during a weekend of wine and culinary events. More than fifty award-winning wineries showcase their wines, reflecting the quality of the region’s nine distinct American Viticultural Areas. Once again we headed to Monterey to experience this great event. 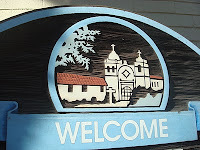 On this visit we based out of the very beautiful and quirky town of Carmel-by-the-Sea. Our drive on day one of our journey started with a spiritual look at the area as we visited Castle Rock. 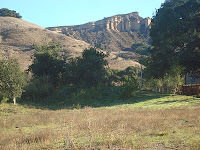 The area made famous by John Steinbeck in his book “Pastures in Heaven “. 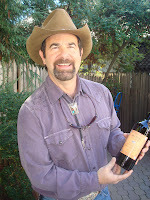 We could not have thought of a better way to start than than with Evan Oaks, owner of AG Venture Tours and Steinbeck expert. As Evan read passages from “Pastures in Heaven”, in a pasture with Castle Rock behind him , you could almost feel John Steinbeck’s presence with every word . 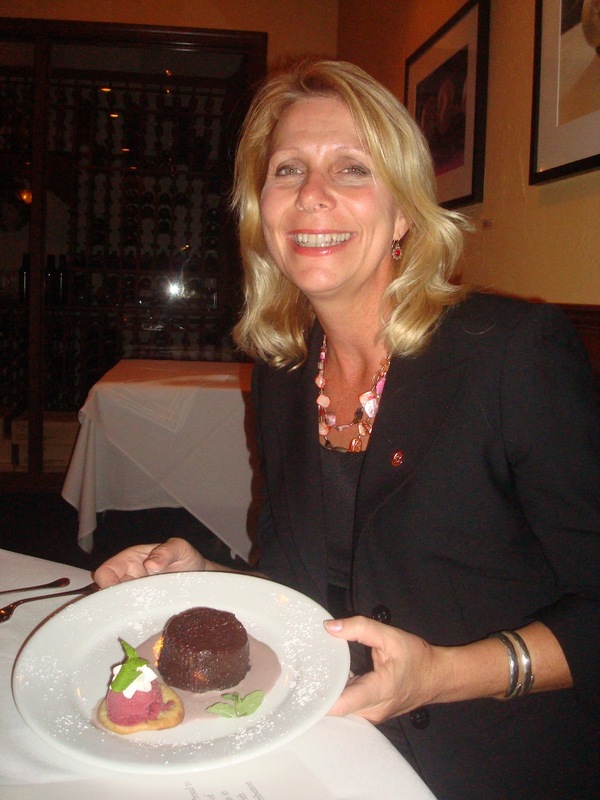 Rhonda Motil , Executive Director of the Monterey County Vintners and Growers Association joined us at this literary landmark as well. She explained how “ The Thermal Rainbow of Monterey “ is a visual representation of Monterey Bay’s influence creating micro climates throughout Monterey County. The coolest areas are to the north and closest to the ocean , while the warmest areas are to the south and more inland. 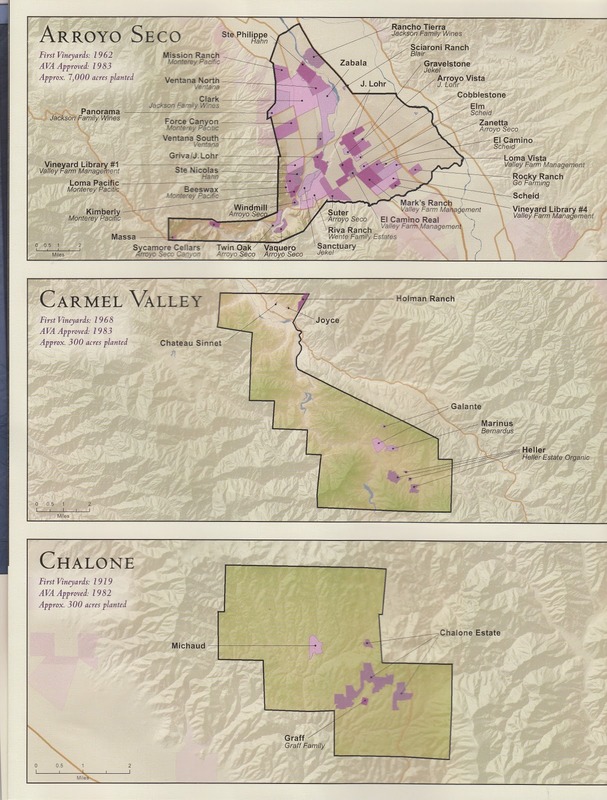 She also added that 42 different varietals are planted in the county with Pinot Noir and Chardonnay doing well in the north; Cabernet Sauvignon , Zinfandel and other Rhone varietals feel at home in the warmer south parts of the county. Forty thousand planted acres make Monterey County their home and have been farmed sustanablity for quite some time. 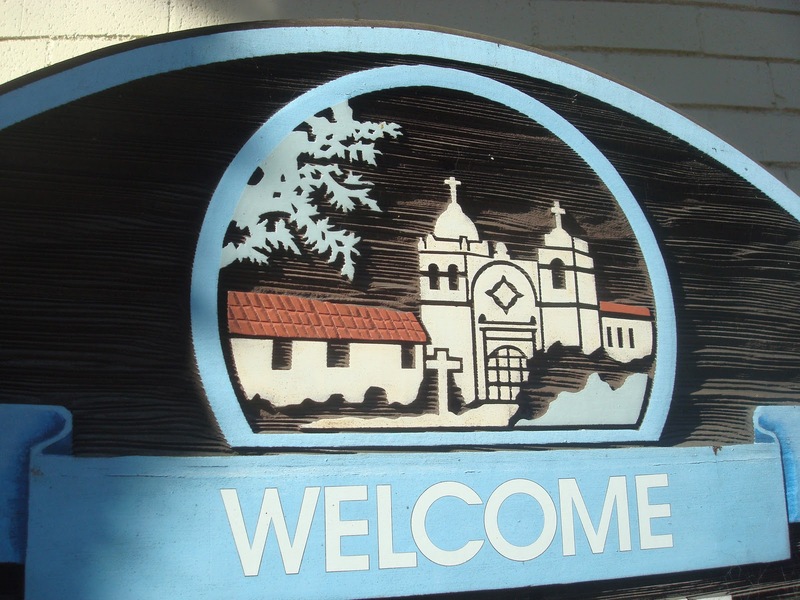 On Friday the Wine Experience guests could experience a multitude of winery open houses all over the county from Monterey, Carmel valley and Salinas . 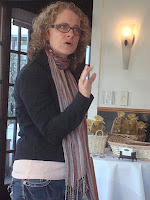 This unique opportunity gave the guests a chance to experience first hand the quality of Monterey Wines from Chardonnay, Pinot Noir and Rhone Varietals as well. 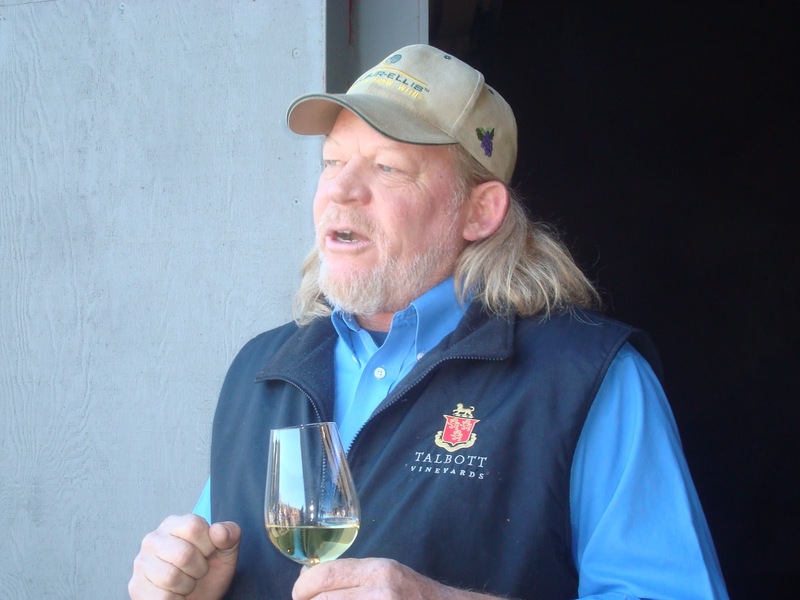 Talbott Winery was our first stop and visited with the legendary winemaker Dan Karlsen . As Dan spoke to us on subjects ranging from his wines, background and winemaking philosophy we walked with him and sampled lovely Talbott Chardonnays and Pinot Noir. 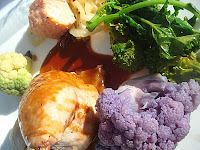 With Lunch time upon us , how could we refuse a lunch at Hahn Winery prepared by Chef Brain Overhauser and lovely fresh Andy Boy vegetables, joined by Margaret D’Arrigo her self. 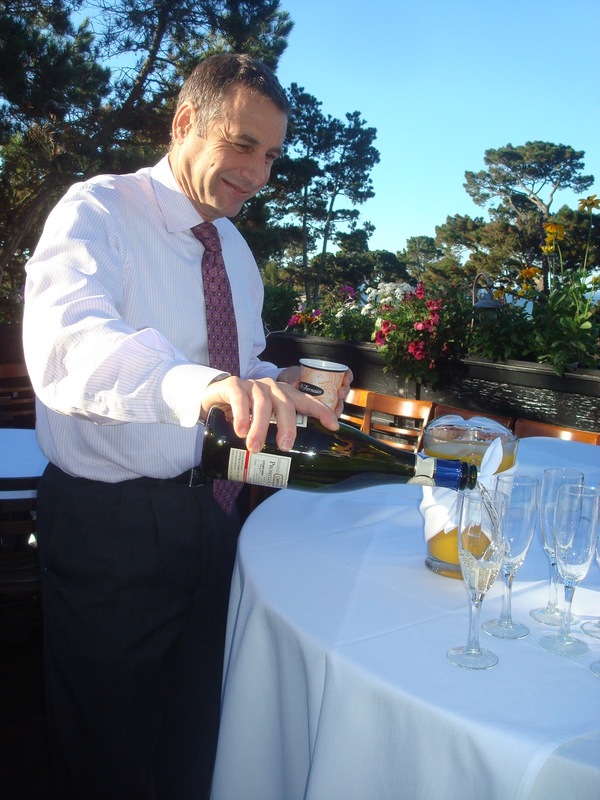 If walking around the aquarium was not “your thing “there was also the Wine Enthusiast Signature Winemaker Dinner at the InterContinental, The Clement Monterey on Cannery Row. 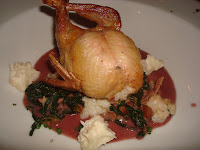 This lovely dinner showed off one of Monterey Wine Country’s signature varietals, Pinot Noir. 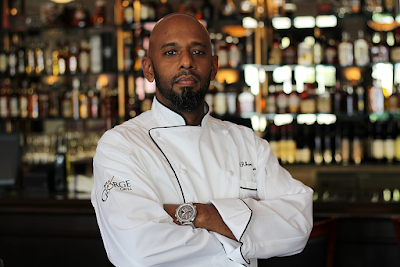 Wine lovers with a passion for Pinot Noir enjoyed this exclusive opportunity to taste through an exclusive varietal tasting, paired with a five course meal under the direction of Executive Chef Jerry Regester of the InterContinental, The Clement Monterey. 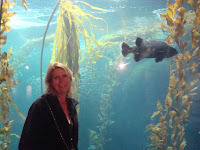 Perhaps for many , this would have been a pretty full day of activities, but the Great Wine Escape Weekend had one more treat and that was for the guests to end their day at the world famous Monterey Bay Aquarium. 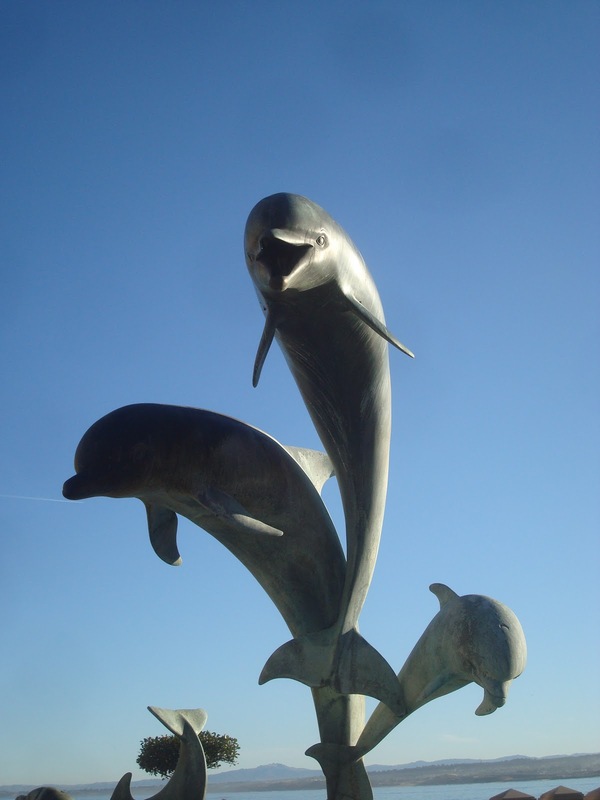 Everywhere you look on the famed Cannery Row you can feel history. The sun setting over the Monterey Bay , sounds of the seals barking and the smell of the ocean spray on the rocks below provided guests a picturesque walk to a Barrel tasting of new and unique wines at the Aquarium. 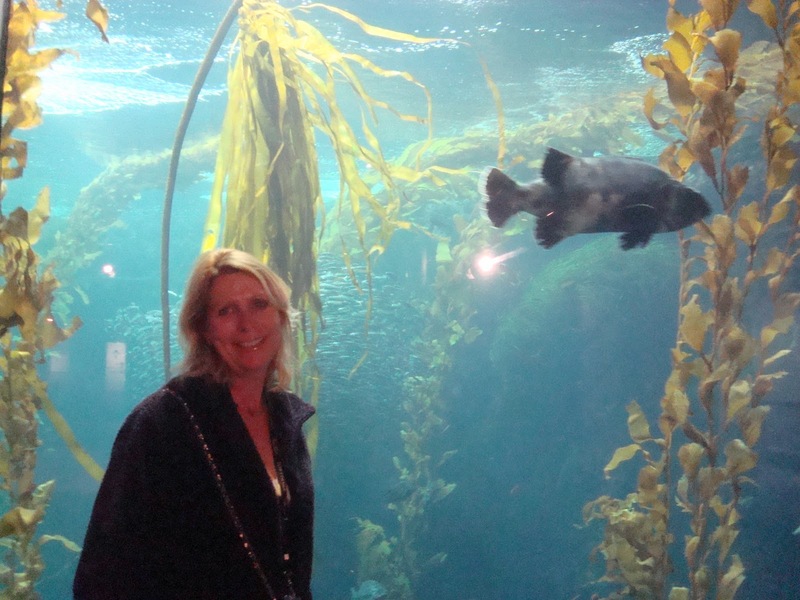 Visiting the Aquarium at night is always a very special treat. 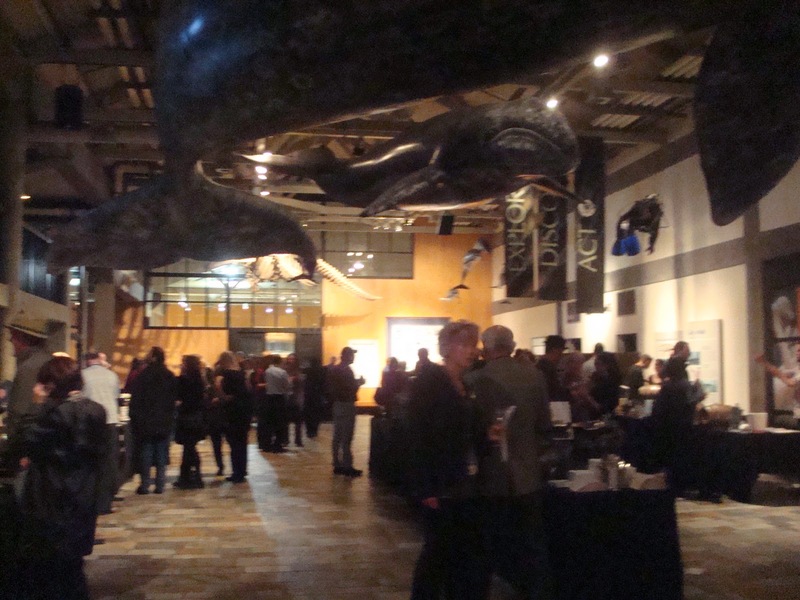 And what a better way to see it than sipping unreleased wines as you stroll through what seems endless displays of colorful fish , seahorses , otters and so much more. 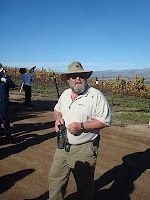 Many legendary wineries and winemakers were present to give the guests a pre-view of upcoming vintages. 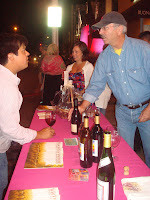 Michael Michaud himself was pouring guests a pre-view of his very nice Pinot Noirs. 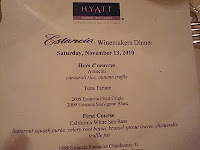 Other big names such as Ventana , Hahn , Estancia and J.Lohr were also there showing what we can expect in the years to come. The great thing about this whole region is that there are very fine smaller wineries that produce outstanding wines from Chardonnays to Pinot Noirs. 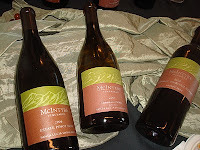 McIntyre Vineyards impressed many with their Pinot Noirs . Wrath is known for some pretty high scoring wines and they did not disappoint anyone on this night with some of the best Pinot Noirs we have tasted. Scheid Vineyards, Manzoni Estates, Lockwood Vineyards and Pierce Ranch Vineyards all showed some very fine wines from different areas of the county showing off the county’s diversity. The Second day of this great event focused guests on a series of Wine County Boot Camps that provided a hands on experience blending and sweating like a winemaker . 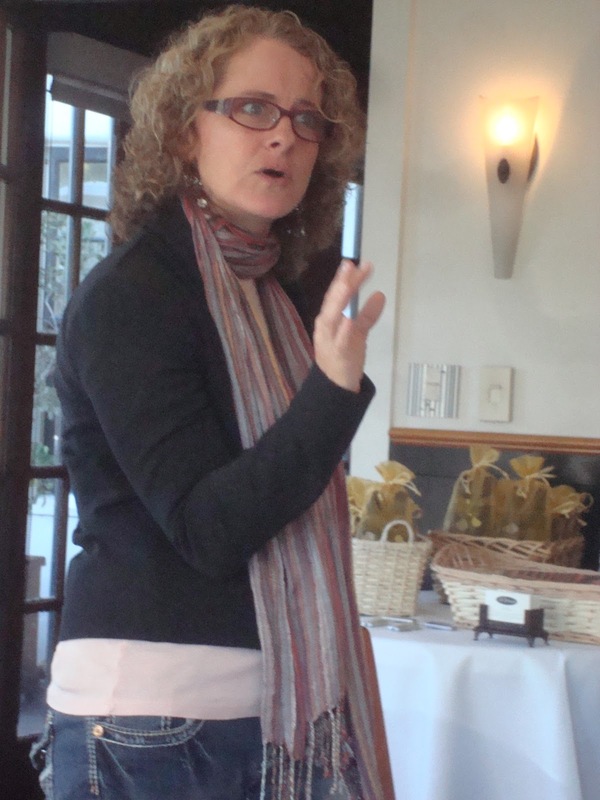 The Carmel Valley Boot Camp / Wine 101—Château Julien Wine Estate featured a wine sensory seminar and barrel education and vineyard walk. The Salinas Valley Boot Camp / Vineyard to Table— Scheid Vineyards shared what it takes to farm and grow grapes in Monterey Wine Country and teamed up with Paraiso Vineyards for a hands-on Wine Blending Seminar. 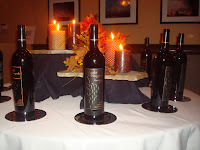 On Cannery Row the Great Wine Escape Weekend provided guests a variety of choices to enjoy Monterey County. The Oenophile’s Delight at the InterContinental, The Clement Monterey offered a cheese and chocolate pairing with the wines of Monterey County, A guided tasting through Monterey’s 9 AVAs or a Riedel wine glass demonstration. 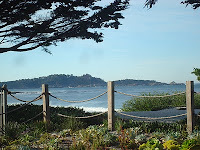 Having been in the vineyards the previous day we decided to spend some time in the very quaint city of Carmel-by-the-Sea. The IL Fornaio at The Pine Inn was the first stop of the day. General Manager John Ratto and his staff provided us with mimosas and breakfast as we were joined by Kris O’Conner from the Central Coast Vineyard Team . 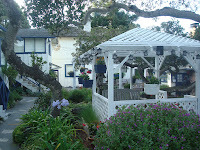 Carmel –by-the-Sea was designed from the very beginning to be a “walking town”. Who better than to join us for a walk was Monta Potter , Executive Director of the Carmel Chamber of Commerce. As we walked the cobble stone streets and enjoyed Carmel’s unique character , Monta pointed out highlights and history that has made Carmel one of the leading travel destinations in the world. 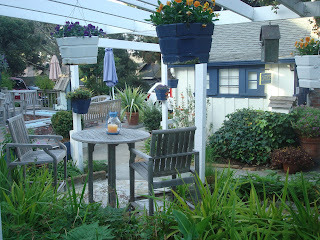 Carmel is also home to some lovely tasting rooms as well. It did not take much prodding to make a stop at the Galante Vineyard tasting room where we were joined by Jack and Dawn Galante. In addition to growing and producing wine, Jacks Great Grandfather J.F Devendorf was the founder of Carmel ! . The Galante 2009 Sauvignon Blanc with only a 580 case production provided a refreshing break from our walk around Carmel. Jack was more than gracious and tasted us on his Pinot Noir , several very nice Cabernet Sauvignons , Syrah and his very special 2007 Grand Champion blend of Malbec, Petit Syrah and Cabernet Sauvignon that he only produces 378 ( 6 pack ) cases. 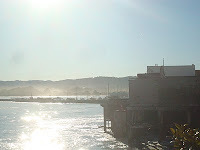 Cannery Row was calling us again as we made our way back to Monterey to join the many attendees for the main event of the weekend , Taste the County in 175 Sips at InterContinental, The Clement Monterey. 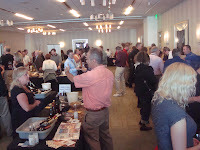 All of the events during the weekend pointed to this fabulous event where guests could enjoy wines from over 30 wineries from every corner of the county. 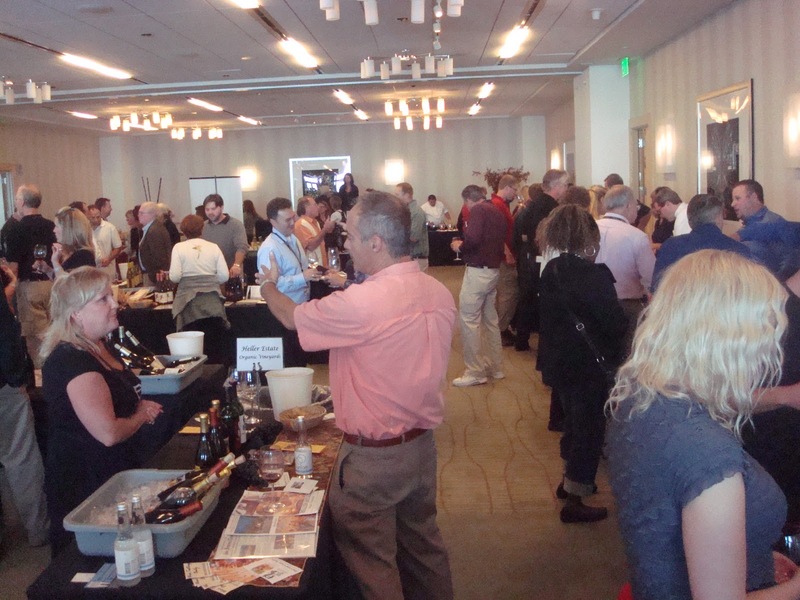 The ballroom at the InterContinental was buzzing with excitement as the guests entered the room with great anticipation of tasting outstanding wines and enjoying some signature dishes and Executive Chef Demonstrations. Many of Monterey county’s hidden gems were on hand right next to legends like Phil Woodward ( Chalone Judgment of Paris 1976 fame ) of Graff Family Vineyards and and Michael Michaud from his namesake vineyard Michaud . We made a stops at Wrath , Otter Cove , McIntyre , Delicato and Estancia as well. Having all of these wonderful wineries in one place really showed off the diversity of the county and the wines they produce. 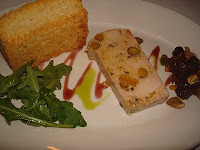 ﻿ When you have great wines you have to know that there would be some great food as well. 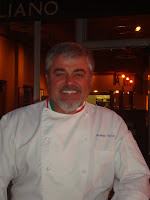 Many of the area best Chefs were in the house and made sure we did not go hungry. Local favorite Chef Todd Fisher was one of our first stops as we worked our way through the tasting. 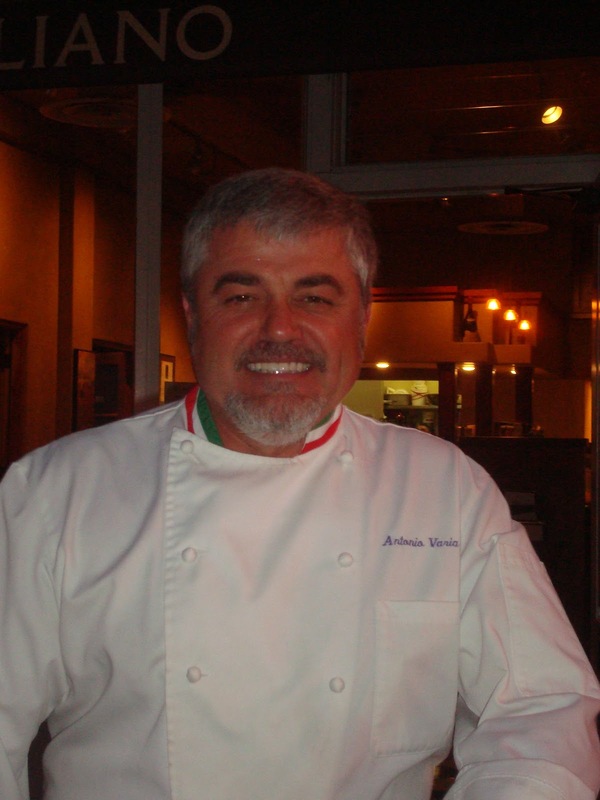 IL Fornio’s Executive Chef Gabriel Rodriguez and Carmel Valley Ranch Executive Chef Tim Wood both kept the guests coming back for more. The sun was beginning to set once more over beautiful Monterey Bay , but just like the day before , There was more to come. 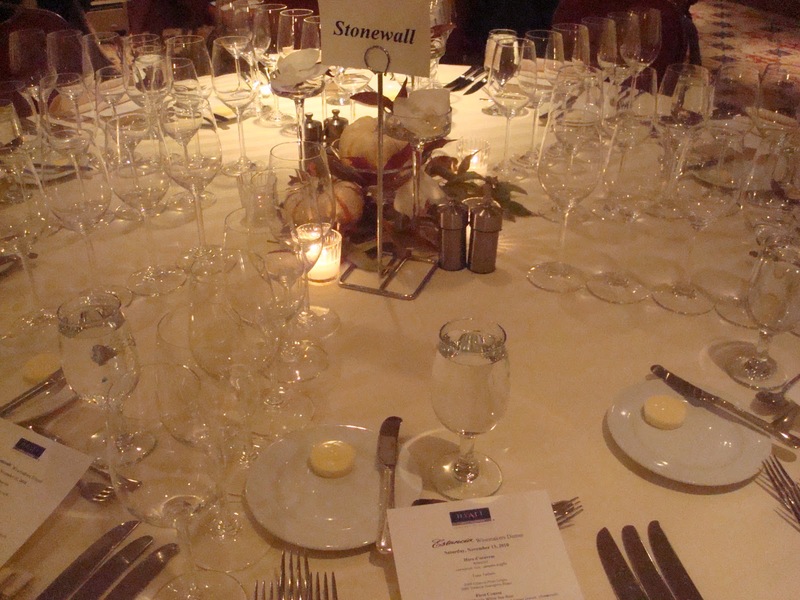 Guests had a choice of over a dozen Winemaker dinners held all over the county to tantalize their wine and culinary palates. For us , it was a very special invite only dinner at the Pacific’s Edge Restaurant at The Highlands Inn on the cliffs overlooking the Pacific Ocean. 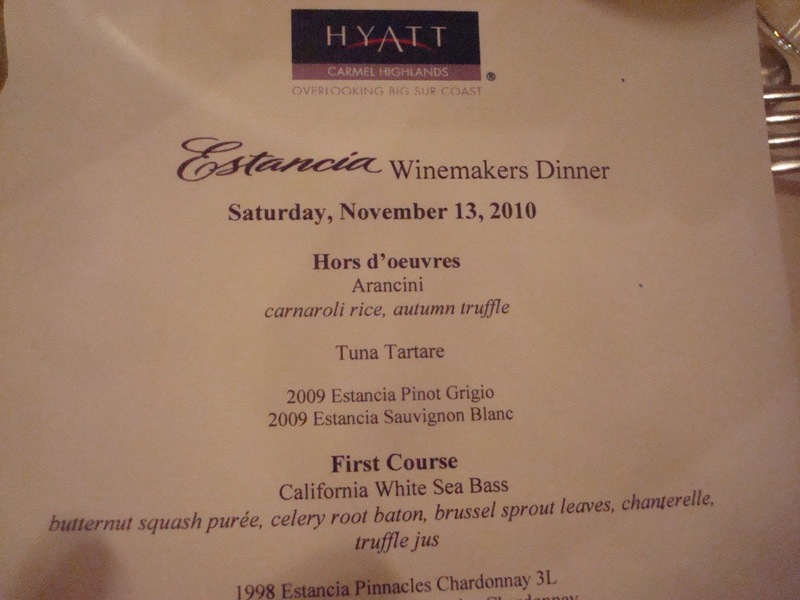 When invited by Estancia Winery and Host , Winemaker Scott Kelley to attend a winemaker dinner at one of the Top 100 Zagat Rated restaurants and USA Today’s Top 10 Restaurants with a view in the country, we did not hesitate. The five course winemaker dinner created by Executive Chef Matt Bolton set the stage for a memorable evening with a wonderful pairing of exceptional food and wine. 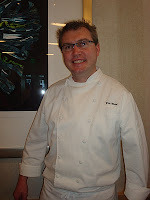 The final day of The Great Wine Escape weekend focused on the Culinary Skills of very talented Executive Chefs. A Culinary Showcase and Lunch provided intimate cooking demonstrations presented by The Food Network’s Executive Chef, Robert Bleifer and Jerry Regester, Executive Chef, InterContinental, The Clement Monterey and was wonderful way to end the 14th Annual Great Wine Escape Weekend and send guests home happy and content. 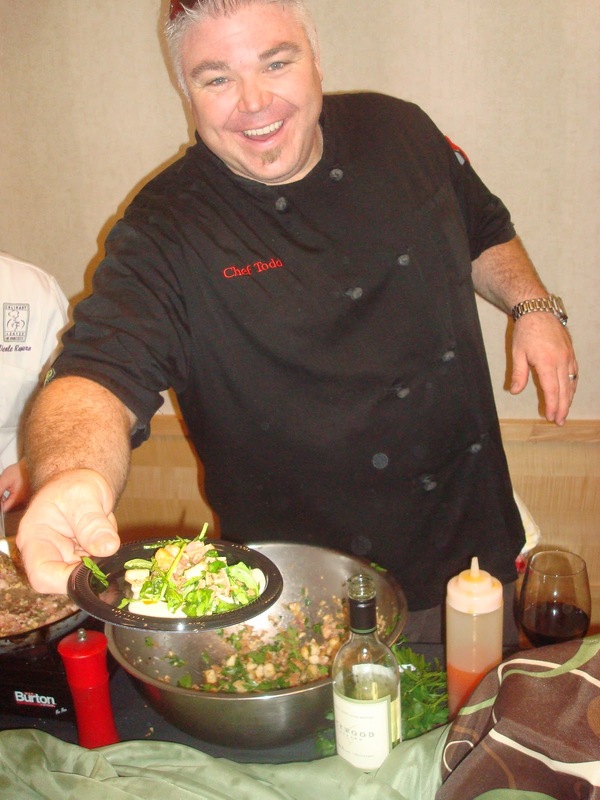 Monterey County , from the history of Cannery Row to Steinbeck’s Salinas Valley ,world class wines and award winning Chefs is now being recognized world wide for the special region that it has become. 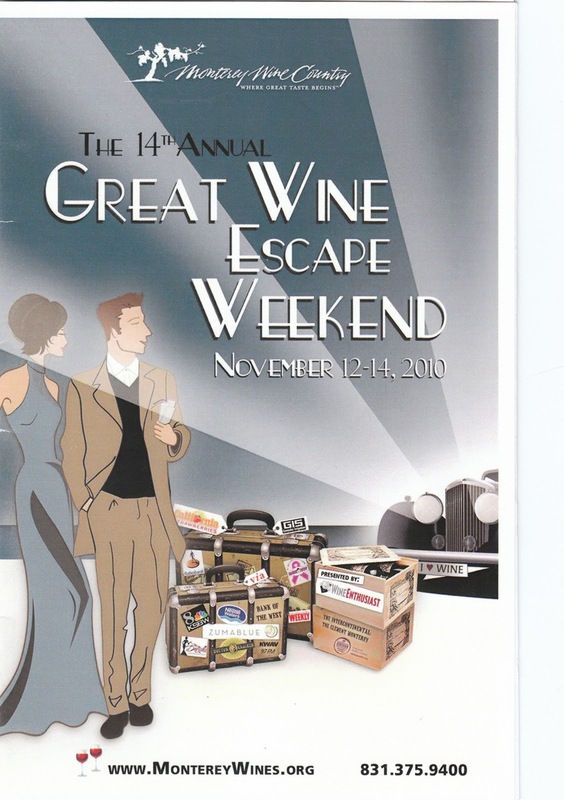 The 14th Great Wine Escape Weekend was a great way to explore the entire county and we have already marked our calendar for November 11-13th 2011 for the 15th Annual event. 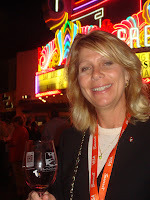 Join Elaine Harris Editor-In-Chief of The Cuisineist as she takes you on 4 day journey through the Food and Wine of Monterey County and see you next year ! Monterey County California is situated south of San Francisco and north of Santa Barbara. Over 90 miles of the most fertile farm and vineyard land is located right in this very special area of California. On January 1st 2011 exploring the wines of Monterey just got a lot easier. 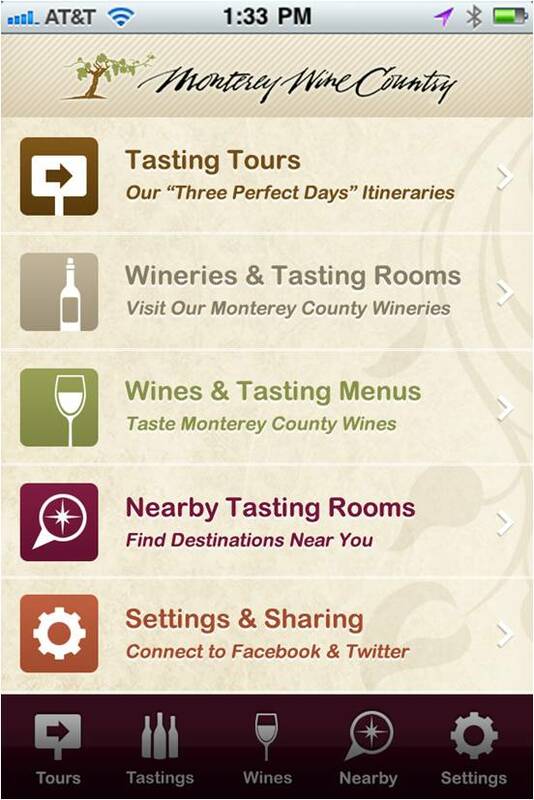 The Monterey County Vintners and Growers Association will launch their Mobile phone application that puts a plethora of wine touring and directions at your finger tips. The application will use location based services to provide detailed itineraries and the ability to view tasting rooms near by. 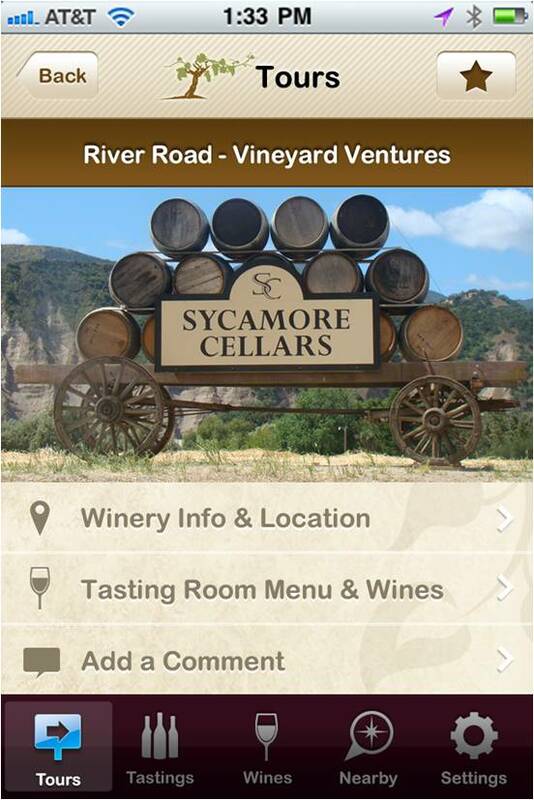 The free application includes information on over 30 tasting rooms in Monterey, Carmel and River Road Wine Trail area , and wine tasting menus to help guide visitors to tasting rooms they way want to visit. In addition, wineries are able to update their tasting menus with new wine releases with real time information for guests. “This application will allow guests to make quick decisions that fit their lifestyle and travel plans. Traveling with a dog so you need to stop at a tasting room that is pet friendly, but want to make sure the tasting room has Pinot Noir on their tasting menu? We’ve got you covered! The user friendly application will allow you to develop your itinerary from criteria that are most important to wine tourists “said Rhonda Motil , Executive Director of the Monterey County Vintners and Growers Association. 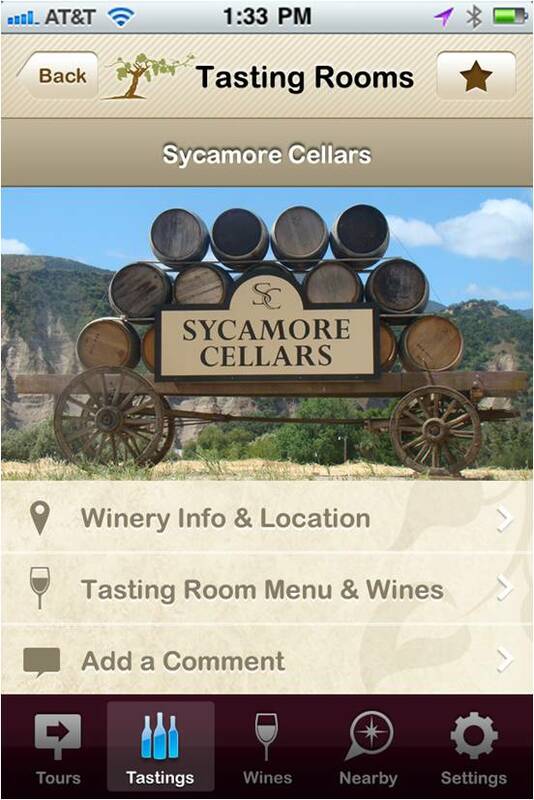 Wine tourists can even mark their favorite destinations within the application, with the ability to add comments to aid future visitors as well. This very nice application also allows users to “Make your own Itineraries” function and full integration with Twitter and Facebook. An application like this has been long overdue and its ability to give tourists real-time , “on the fly “ information is a major benefit. After seeing a pre-view of this fine application, this should be the first download of the year for any wine lover who has plans to travel to this remarkable area. 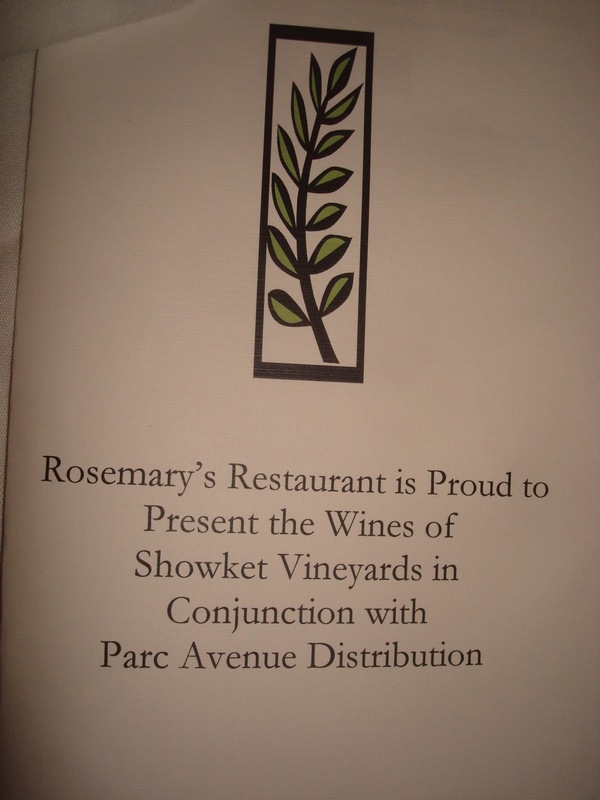 Rosemarys Restaurant in Las Vegas has been a delightful dining venue for us for many years . We have met many good friends while at the bar for their Wednesday ladies night and their very popular Sunday 1/2 price bottle night as well. Chef Michael and Wendy Jordan draw from a variety of culinary influences to create French-inspired, creative American cuisine with regional twists from New Orleans, the Deep South and the Midwest. 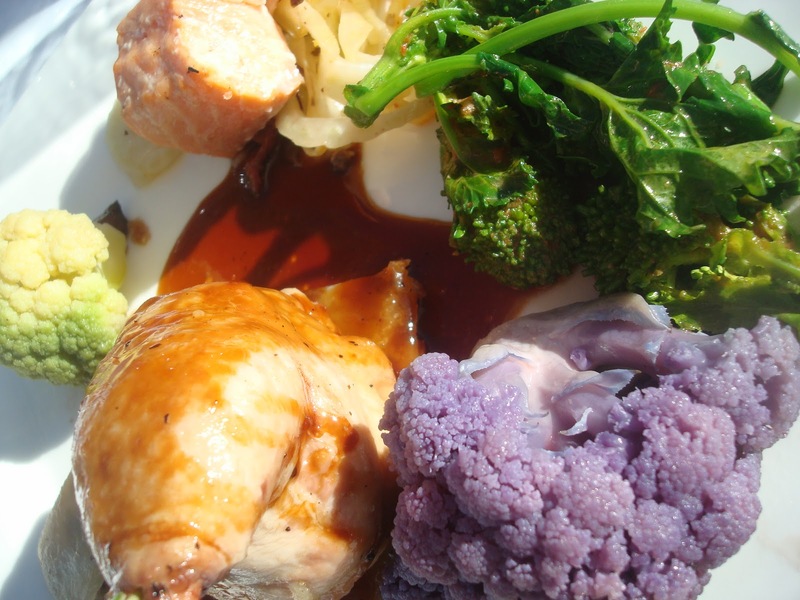 Most important of all is that they are real people and treat their dining guests as a member of their family. 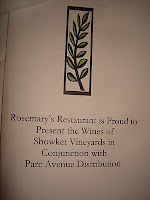 Rosemarys Restaurant is not only well known for its food but their wine list as well. Of course they have some of the big names that many would come to expect at a Restaurant of this caliber . 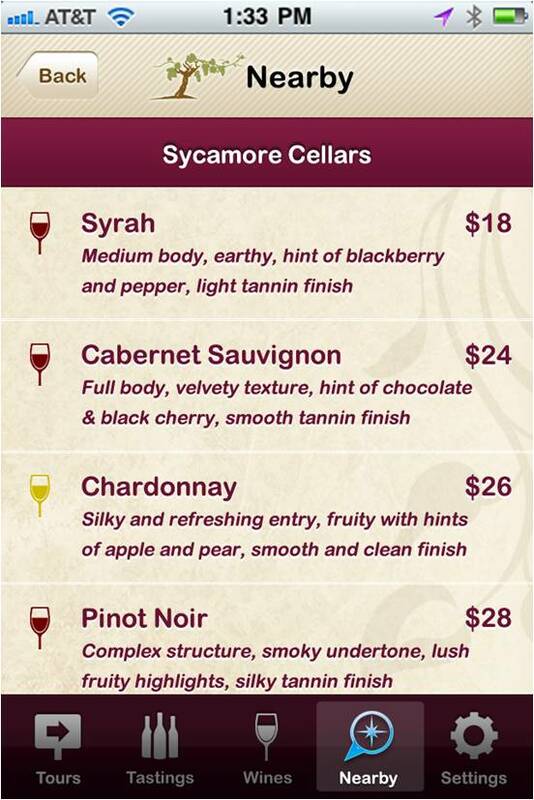 However , their list also features many boutique wines, many of which may not be found anywhere else in town. 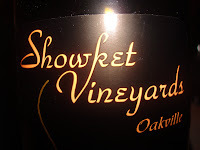 Showket Vineyards from the hollowed ground of Oakville California is one of these very special wines and recently had a 5 course wine dinner that showed off this incredible wine and great pairing skills of Chef Michael Jordan and Wine Director James Repman. The Story of Showket is a very interesting one.After searching for three years, in October, 1988, Kal and Dorothy Showket bought a beautiful property in the hills overlooking Oakville in the heart of Napa Valley. 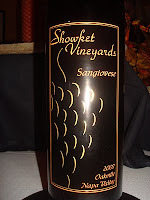 The Showkets knew they had a unique location, but they also knew they had much hard work ahead of them in order to bring the vineyard up to its potential. 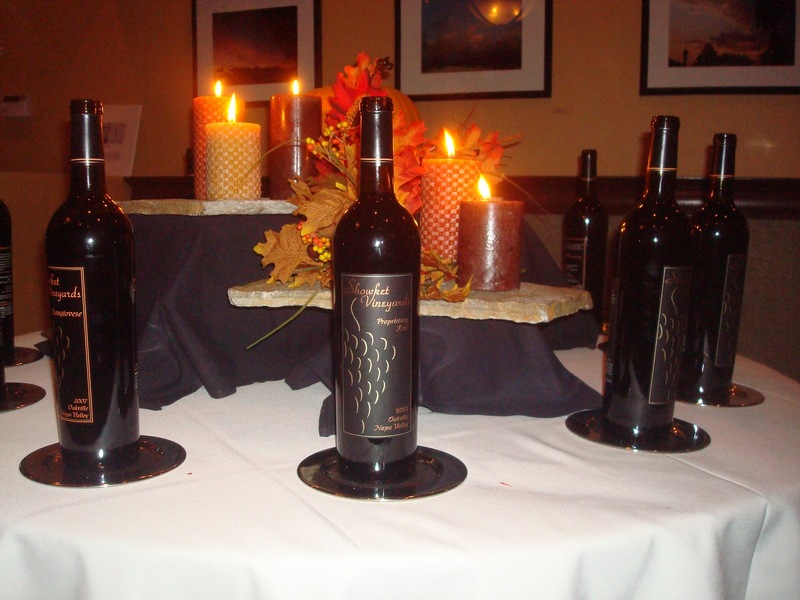 The soils of Oakville are known to be one of the top winegrowing regions in the world for Cabernet Sauvignon. The concentration of cult wineries in this area is a testament to the high quality of wines this part of the world can produce. 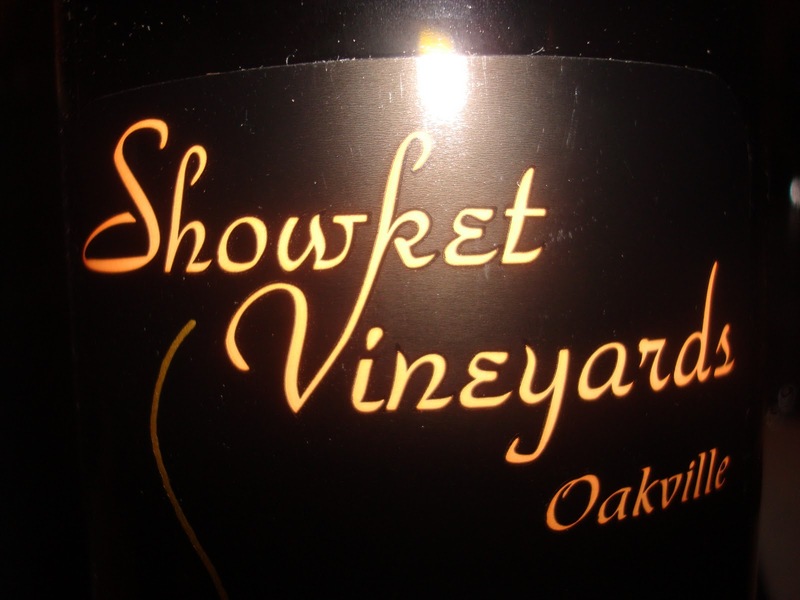 Within the Oakville appellation, Showket Vineyards with an elevation of approximately 600 feet is perched in the hills above Silverado Trail. 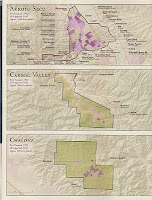 With neighbors like Dalle Valle, Vine Cliff, Phelps’ Backus vineyard, Oakville Ranch, Turnbull’s Weitz Vineyard and sitting above Screaming Eagle and Rudd Estate , they are in very good company. 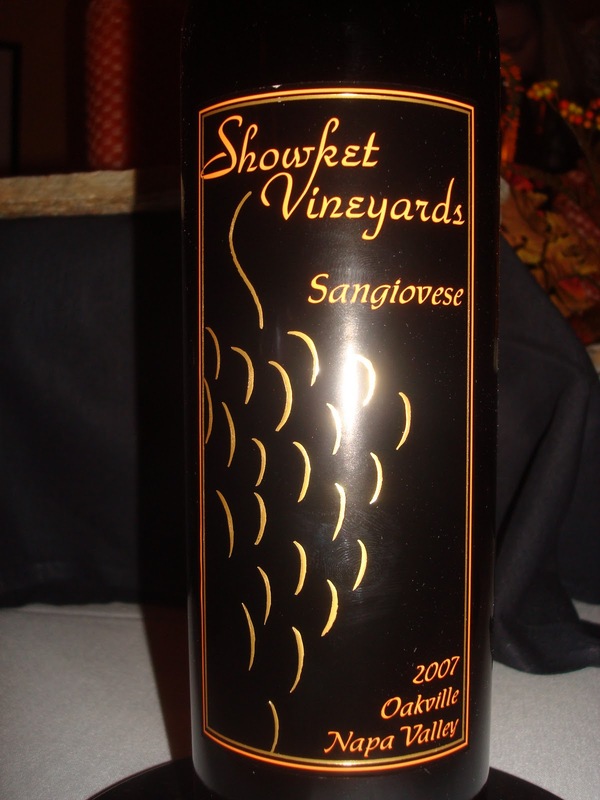 Before producing wines under their own label, the Showkets sold some of their fruit to top wineries like Caymus, Dalle Valle, and Shafer. Because of the elevation and orientation of the vineyard no frost protection is required. The soil is clay-loam type that is very rocky. The vines are stressed sufficiently to produce excellent wines. For the opening cocktail , a favorite of Hemingway himself , " Death in the Afternoon " Champagne Cocktail. It was a very interesting start to what should be a great dinner. This very big wine with black cherry and plums went well with the spicy Arugula and Cherry Relish for a nice paring that showed off the subtle flavors of the dish. 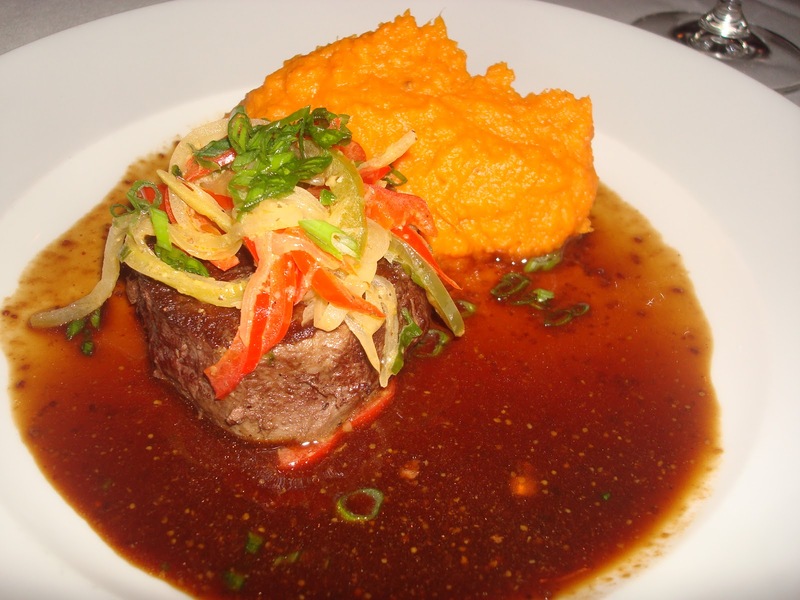 The meatiest dish of the night fared well with the Merlot's dark chocolate accents coming through first and followed by the Cabernet and its classic cassis notes for a very balanced dish that kept these usually big flavors in perfect harmony. What a better finish could one ask for than an excellent contrasting pairing. The dark chocolate bread pudding with the Cabernet's classic cassis and blackberry notes made the first bites a nice treat of contrasting flavors and adding the cassis sorbet was like putting an exclamation point at the end of a sentence. Guests could not help but go home with smile after such a very special dinner that featured a small vineyard from a premier appellation teamed up with the culinary genius of Chef Michael and Wendy Jordan and their staff. 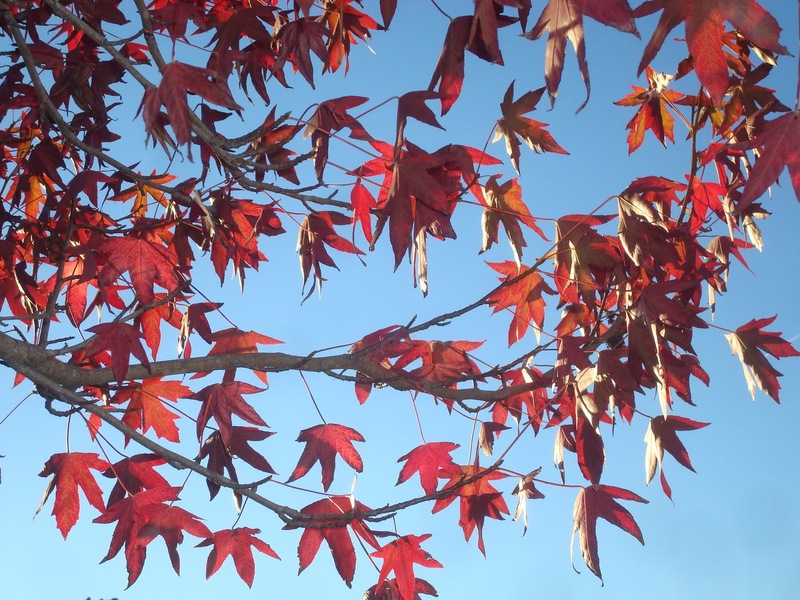 California's Central Coast is fast becoming a favorite for Foodies and Oenophiles alike. 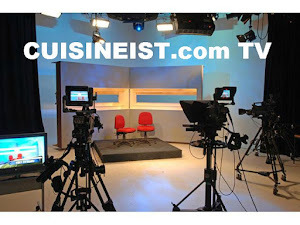 The home of great food , wines and renown Chefs we placed it on our list a places to visit over 6 years ago and it just keeps getting better and attracting world wide attention. 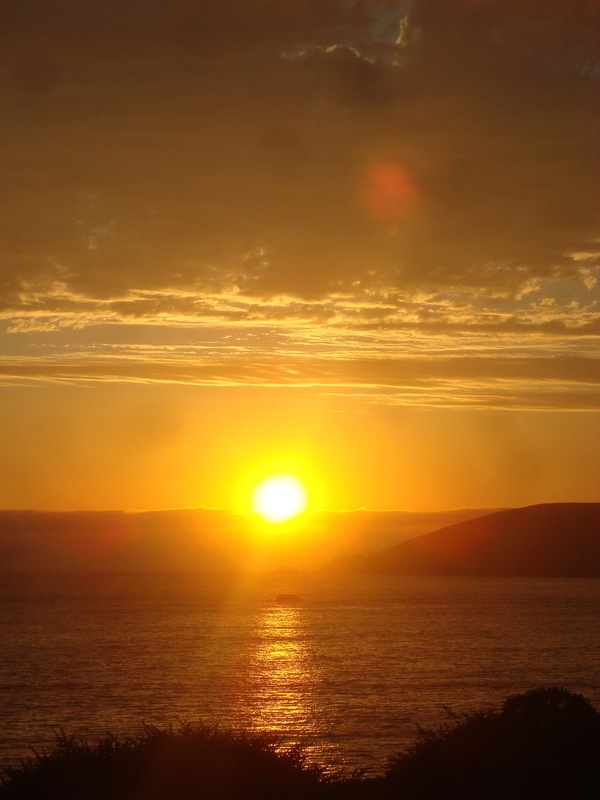 Sunset Magazine is a primer magazine that has always pointed its readers in the Western United States to the finer things in life from Spas, Resorts , Dining and much more. 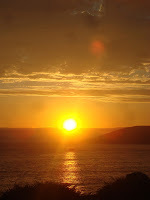 The Central Coast got some great news when Sunset Magazine wanted to bring this area to the attention of its readers. Sunset Magazine , City officials, Farmers and Vineyard owners worked together for over a year to create an event on a scope this area has never seen. 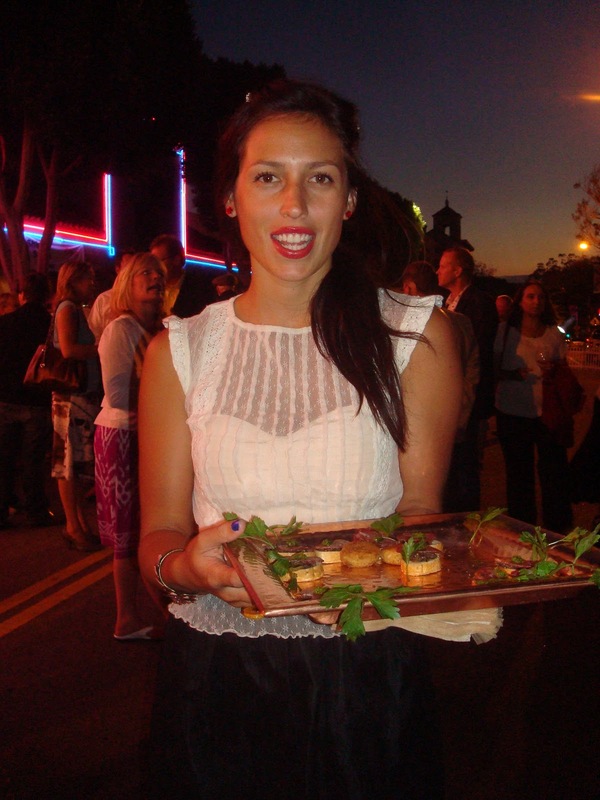 SAVOR The Central Coast was created and is sure to become one of the finest events in the country. 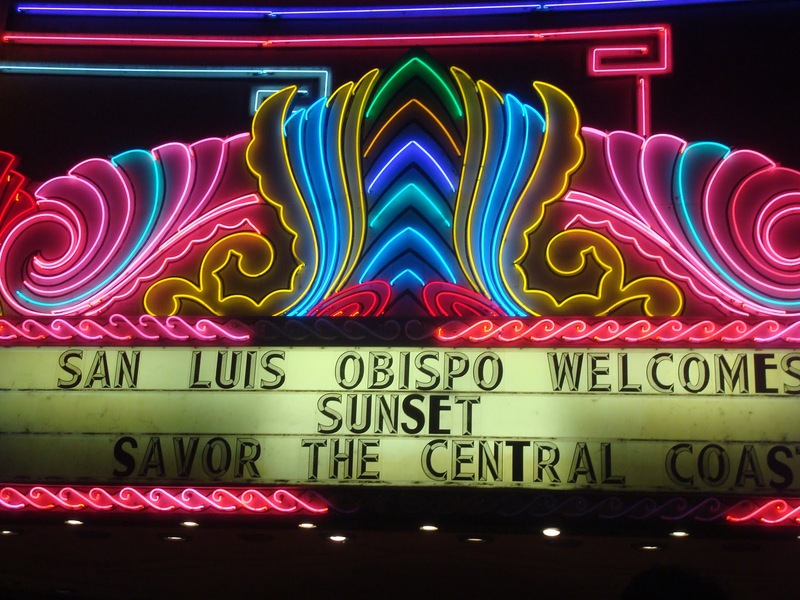 The organizers and guests alike could not have hoped for a better evening than a cool , cloudless night above San Luis Obispo as the festivities began. 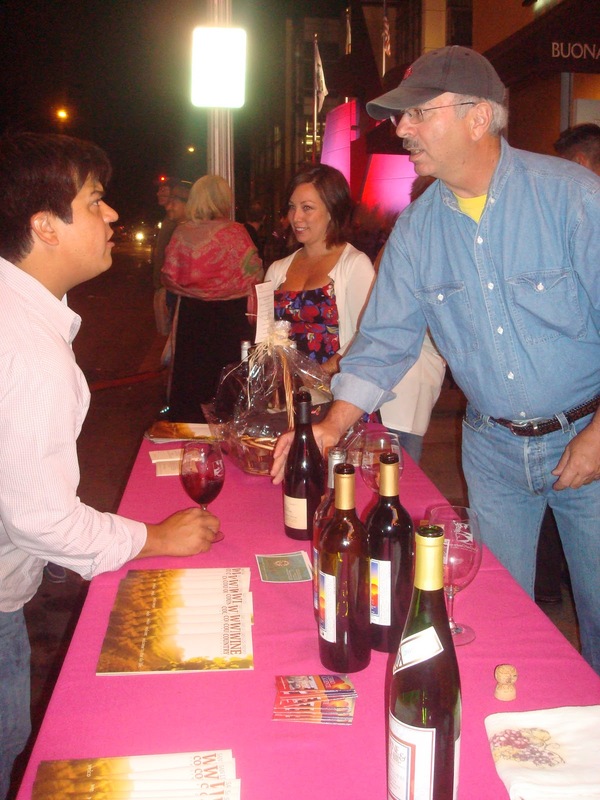 Many winemakers were on hand stationed outside the Fremont Theater to pour some of their best for the guests as they strolled down Monterey Street with live music and local restaurants passing out tasty morsels. 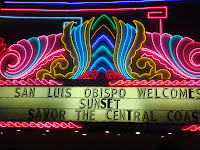 San Luis Obispo Mayor Dave Romero took to the stage with excitement as the years dream was now a reality with his city being the center of many of the events . 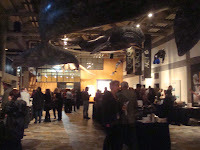 After the Mayor officially opened the event the festivities began at full speed with music , food and of course wines. As the evening continued guests were dancing in the streets to the music and to the anticipation of what the next 4 days of this inaugural event would bring. Over the upcoming days guests were looking forward to taste locally grown produce and artisan foods , attend cooking demonstrations from celebrity Chefs and sample some of best wines in the country from over 200 wineries. Sunset Magazines Editors were going to be on hand as well to show guests how to grow vegetable gardens , make preserves , and even raise chickens. There was going to be something for everyone to enjoy and many waited with great anticipation for the events to start the next day and the days ahead.